The Terminal User Interface (TUI) is one of three router user interfaces. The other interfaces are the Web User Interface (WUI) and Command Line Interface (CLI). Each interface allows you to set up, modify, and view router configuration variables and operational data. The Terminal User Interface is a system of hierarchical, character-based menus. See the nearby overview for a graphic map of the interface. 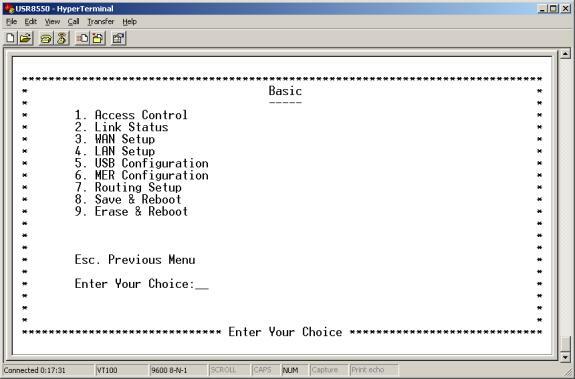 Access PPPoA configuration menu from Main Menu screen. Choose 2 for ‘ADVANCED’, 7 for ‘SNDCP’, 3 for ‘PPPoA’, and 2 for ‘CONFIGURE PPPoA’. Screen shots best describe some menu options. In this manual, a description precedes each screen shot. Afterward, the manual provides definitions of screen variables. Pages without screen shots include a menu path, followed by a description and necessary definitions. Connect a console cable between a computer and the router. Launch a terminal emulation program. Turn on the router. Configuration messages appear as the router boots up. Allow the default configuration to load. When prompted, type in the User Name and Password. The default user name is Root. The default password is 12345. Enter 1 to open the to the Basic Menu. Enter 2 to open the Advanced Menu. Enter 0 to exit the Terminal User Interface. • List Users. Lists currently defined users by type, and provides associated services. The user “root” is the default administrative login for the router. • Delete User. Allows you to delete users by user name. Enter 3 at the Basic Menu. The WAN Setup Menu appears. This menu allows you list, configure, or delete ATM PVCs. Each option takes you to another screen. • ATM PVC List. Enter 1 at the WAN Setup Menu. The ATM PVC List Menu appears. This menu displays a list of currently defined PVCs. Enter a 2 on the WAN Setup Menu. The ATM PVC Configuration Menu appears. Choose the SNDCP option provided by your DSL service provider. Next, SNDCP options for the SNDCP that you selected appear. Subsequent screens present several options for each SNDCP. A. For a bridge PVC, enter a 1 at SNDCP Component. B. Enter the encapsulation type (vc or 11c). A. Enter SNDCP option 2 for routed. B. Choose the encapsulation method. C. Choose to enable or disable the NAT. D. Configure the WAN IP Address. E. Configure the subnet mask. A. Enter SNDCP option 3 for PPPoE. B. Enter remaining information as provided by your DSL service provider. A. Enter SNDCP option 4 for PPPoA. A. Enter SNDCP option 5 for MER. After you complete your configuration, proceed to the Basic Menu and enter 8. The Save & Reboot Menu appears. From this menu, save your changes and reboot the router. Enter valid VPI and VCI values. Accept default values or enter new IP address and subnet mask values. Use LAN Setup to set the router’s IP Address and Subnet Mask. Setup the LAN IP address to connect the router to. Manage the router from your Local Area Network (LAN). A LAN connects computers in the same building or area. IP addresses deliver packets of data across a network. These addresses differentiate the source and destination IP address and keep them constant. When a router port detects a packet, the router checks the routing table. 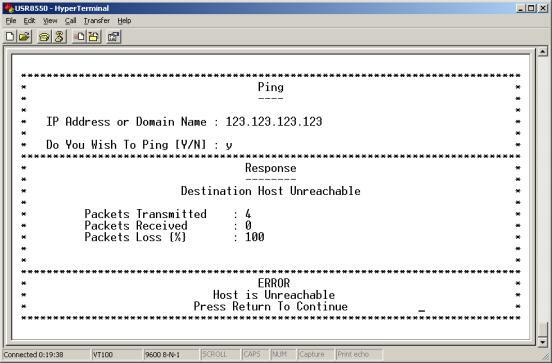 The port attempts to match the network number of the destination IP address with its routing table entry. If the port finds a match, it forwards the packet to the destination network. With no match, the port forwards the packet to a router defined as the default gateway. Enter a valid subnet mask. Enter 7 at the Basic Menu. The Routing Setup Menu appears. 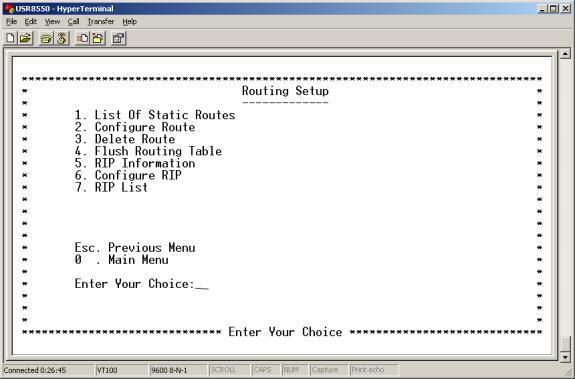 The Routing Setup menu provides seven menu options. These options allow you to configure a route. List Of Static Routes. Enter 1 at the Routing Setup Menu. The List of Static Routes Menu appears. This menu lists defined static routes by Network ID address, subnet mask, and next hop address. Configure Route. 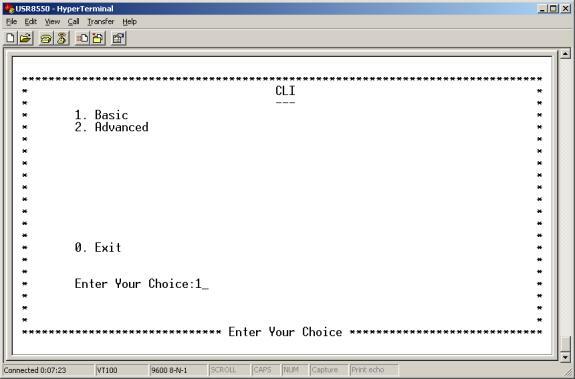 Enter 2 at the Routing Setup Menu. The Configure Route Menu appears. From this menu, you can add new static routes. A router forwards data packets between local area networks (LANs) or wide area networks (WANs). Based on routing tables and routing protocols, routers read the network address in each transmitted frame. Routers then decide how to send the frame. A router bases this decision on the best route. The Configure Route Menu allows you to adjust how the router forwards received IP packets. Enter a valid destination network ID. This is the network IP designation of the network defined in the table. Enter a valid destination subnet mask. 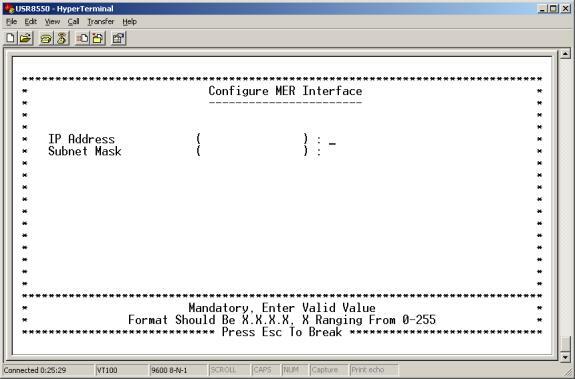 This is the network subnet mask of the entry defined in the table. Enter a valid next hop ID. This is the IP address or gateway that the router uses to arrive at the destination address. 1. Enter the appropriate network ID. 2. Enter subnet mask data. 3. After you complete your configuration, proceed to the Basic Menu and enter 8. The Save & Reboot Menu appears. From this menu, save your changes and reboot the router. 2. After you complete your configuration, proceed to the Basic Menu and enter 8. The Save & Reboot Menu appears. From this menu, save your changes and reboot the router. Enter 5 at the Routing Setup Menu. The RIP Information Menu appears. This menu lists currently configured RIP information. • Configure RIP. Enter 6 at the Routing Setup Menu. The Configure RIP Menu appears. Use this menu to turn RIP on or off. Also use the menu to define which RIP version to use. Routing Information Protocol (RIP) is a routing protocol and is part of the TCP/IP suite. RIP plots a route based on the smallest hop count between source and destination. RIP determines the smallest hop count by communicating with other routers in the network. Only use RIP if the target router also utilizes RIP. 2. Enter a number for the version. Either set RIP Version to 1 (for RIP1) or 2 (for RIP2). The version number must match the RIP version that other routers in the network use. • RIP List. Enter 7 at the Routing Setup Menu. The RIP List Menu appears. This menu displays routes that the RIP has learned. You’ll see an empty list if RIP is off or if the router hasn’t learned any routes. Enter 8 at the Basic Menu. The Save & Reboot Menu appears. This menu allows you to save the current configuration and reboot the router. Enter 9 at the Basic Menu. The Erase & Reboot Menu appears. This menu allows you to erase the saved configuration and reboot the router. Enter 1 at the Advanced Menu. The ADSL Mode Menu appears. This menu allows you to read or write configuration and management variables, or configure the ADSL mode. The router uses configuration and management variables (CMV) to tweak performance and provide management functions. Router firmware defines these values. CAUTION Don’t write configuration and management variables unless you receive explicit instructions to do so. Alteration of CMV values can adversely affect router performance. • Configure ADSL Mode. Enter 3 at the ADSL Mode Menu. The Configure ADSL Mode Menu appears. This menu allows you to switch the ADSL mode to ANSI (T1.413), G.dmt, G.lite or Multimode. Your ADSL service provider determines these values. CAUTION Leave ADSL mode values alone unless you receive specific instructions on what to do. Alteration of the ADSL mode can adversely affect router performance. Enter 2 at the Advanced Menu. The DHCP Server Menu appears. DHCP stands for Dynamic Host Configuration Protocol. This protocol dynamically assigns IP addresses and related information to Local Area Network (LAN) nodes. For temporarily connected network users, DHCP provides safe, reliable, and simple TCP/IP network configuration. DHCP confers these benefits by preventing address conflicts and conserving IP address use. To conserve address use, DHCP centralizes address allocation. List DHCP Server. Enter 1 at the DHCP Server Menu. The List DHCP Server Menu appears. This menu provides a list of currently configured DHCP servers and associated variables. Choose an Ethernet interface. The remaining DHCP options appear on the screen. Create a new DHCP server for the selected interface by entering legal values for each variable. See DHCP variables below. LAN port that the DHCP server will support. First IP address provided on a LAN port node’s DHCP request. Last IP address in the pool provided on a LAN port node’s DHCP request. IP address of the Default Gateway or Router that the node will use. Subnet Mask for the LAN that the node will be on. Domain Name Server. Actually, here we aren’t referring to the DNS itself. Instead, we refer to the IP address of the DNS that the node will use. DNS is a server with a database. The database translates a domain name into a corresponding IP address. For example, “USR.com” resolves into IP address 231.222.320.04. Use this address to communicate over the LAN between the node and USR.com web site. Number of days that the node can use a DHCP lease. Subsequently, you must renew the lease with the DHCP server. DHCP Server Status. Enter 3 at the DHCP Server Menu. The DHCP Server Status Menu appears. This menu displays current DHCP server status. The menu also allows you to enable, disable, or delete DHCP servers. List DHCP Relay. Enter 4 at the DHCP Server Menu. The List DHCP Relay Menu appears. This menu displays DHCP Relay information. Configure DHCP Relay. Enter 5 at the DHCP Server Menu. The DHCP Server Status Menu appears. This menu allows you to configure DHCP relay functions. Suppose that a Dynamic Host Configuration Protocol (DHCP) server resides on a different LAN than the node broadcasting for DHCP service. Then the DHCP broadcast request must be forwarded across the router/WAN to a subnet where a DHCP server resides. To assure receipt of an IP address that corresponds to this subnet, the router relays DHCP. The router must have a record of the DHCP server’s IP address. With this address, the router can direct the request to the DHCP server’s appropriate input IP address. 1. On the Configure DHCP Relay Menu, input the IP address of DHCP server. 2. Enable the relay agent. List of SNMP Entries. Enter 1 at the SNMP Menu. The SNMP Entries Menu appears. This menu lists your SNMP variable settings. Configure SNMP. Enter 2 at the SNMP Menu. The Configure SNMP Menu appears. This menu allows you to configure SNMP variables. Shutdown SNMP Agent. Enter 3 at the SNMP Menu. The Shutdown SNMP Agent Menu appears. This menu allows you to shut down the SNMP agent. Firewall Policies. Enter 1 at the Firewall Menu. The Firewall Policies Menu appears. Select Policies or Action, or press <ESC> to exit to the previous menu. Enter 1 at the Firewall Policies Menu. The Policies Menu appears. This menu allows you to add, list, or delete port firewall policies. Priority of the policy that you’re creating. Options range from 0 to 65,535. Data source. Either an IP address or network. Subnet Mask for the data’s network source. Options range from /12 (255.240.0.0) to /32 (255.255.255.255). Data destination. Either an IP address or network. Subnet Mask for the data’s network destination. Options range from /12 (255.240.0.0) to /32 (255.255.255.255). Transport layer source port. Options range from 0 to 65,535. IP protocols to be filtered. Options are: Any (all), TCP, UDP, ICMP, AH, ESP. Filtering of the TCP Flags that control session setup and termination. Options are: None, urg (Urgent), ack (acknowledgment), psh (push), rst (reset), syn (synchronize), fin (finished). List Firewall Policies. Enter 2 at the Policies Menu. The List Firewall Policies Menu appears. This menu displays implemented firewall policies. Press <ENTER> to see the next page in the list. Delete Firewall Policies. Enter 3 at the Policies Menu. The Delete Firewall Policies Menu appears. This menu allows you to delete Firewall policies. Enter 2 at the Firewall Policies Menu. The Action Menu appears. This menu allows you to add, list, or delete firewall actions. Name of the Interface to apply the parameter to. Specifies whether the action applies to incoming, outgoing, or both incoming and outgoing traffic. Options are Any, In, and Out. Permits packets to enter or leave the system. Drops the packet and issues an “unreach host” ICMP error. The parameter applies during the time period that you specify. Select the start (From) day, time and stop (To) day and time. List Firewall Action. Enter 2 at the Action Menu. The Firewall Action List Menu appears. This menu displays implemented firewall actions. Delete Firewall Action. Enter 3 at the Action Menu. The Firewall Action Add Menu appears. This menu allows you to delete Firewall actions. Enter 2 at the Firewall Menu. The Port Range Mapping Menu appears. This menu allows you to add, list or delete port range mapping. Add. Enter 1 at the Port Range Mapping Menu. The Add Menu appears. This menu allows you to add port range mapping entries. NAT stands for Network Address Translation. NAT enhances the power of Port Range Mapping. Together, they can map a local IP address and port to a public IP address and port. To add a port range entry, enter starting and ending addresses to map them to a single public address. Set the public, destination IP address inside a packet header. The router will map or redirect packets with the address that you specify. Set the first (From) port of the public address that the router maps or redirects. Options range from 1 to 65,535. Set the last (To) port of the public address that the router maps or redirects. Options range from 1 to 65,535. Set the IP address of a machine on the local LAN. The router directs packets to this address. Set the first (From) port of the local address that the router uses. Options range from 1 to 65,535. Set the last (To) port of the local address that the router uses. Options range from 1 to 65,535. Set protocol. Your protocol setting applies to the other parameters on this page. Your options are TCP or UDP port numbers. List. Enter 2 at the Port Range Mapping Menu. The List Menu appears. This menu displays configured port mapping entries. If you find an empty list, then you haven’t defined any entries. Delete. Enter 3 at the Port Range Mapping Menu. The Delete Menu appears. This menu allows you to delete port range mapping entries. Enter 1 at the Firewall Menu. The Static NAT Menu appears. This menu allows you to add, list, or delete Static NAT entries. Static NAT stands for Static Network Address Translation. Static NAT maps local IP addresses to a public IP address. First address in a range of local IP addresses. The router maps these addresses to the public IP address. Last address in a range of local IP addresses. The router maps these addresses to the public IP address. Public address. The router maps local addresses to this public address. List. Enter 2 at the Static NAT Menu. The List Menu appears. This menu displays implemented static NAT entries. If you find an empty list, then you haven’t defined any entries. Delete. Enter 3 at the Static NAT Menu. The Delete Menu appears. To delete a Static NAT entry, enter the starting local address. Enter 4 at the Firewall Menu. The ACL Menu appears. This menu allows you to add, list, or delete ACL entries. ACL provides setup for Proxy services. From the Proxy Configuration Menu, you can enable or disable proxy services. Proxy Services are specialized application programs. These programs accept users’ requests from LAN clients for Internet services like FTP and HTTP. On behalf of LAN clients, the programs then set up connections to servers on the WAN. A proxy server authenticates against the user database. This server filters the request against the Access Control List. The server forwards requests to actual services. Proxy Servers are application specific. Each application needs its own proxy server. Add ACL/FTP. Enter 1 at the ACL Menu. The ACL Configuration Menu appears. This menu allows you to set FTP ACL variables. Options after “User Name” depend on whether you enter “FTP” or “HTTP.” See ACL variables after the http example. Proxy port to configure. Options are FTP or HTTP. A configured user in the router’s internal database. You must configure users through the Telnet CLI with the “adduser” command. FTP command to filter or proxy. Options are Get and Put. Addresses that define the route to a file on the Web or Internet facility. Enter the URL to filter. List ACL. Enter 2 at the ACL Menu. The ACL List Menu appears. This menu displays variables associated with currently defined ACLs. Delete ACL. Enter 3 at the ACL Menu. The ACL Delete Menu appears. To delete an ACL entry, enter the application type and rule ID. Enter 5 at the Firewall Menu. The Proxies Menu appears. This menu allows you to configure a proxy. Configure Proxy. Enter 1 at the Proxy Menu. The Proxy Configuration Menu appears. This menu allows you to enable or disable ftp or http proxies. See the ACL menu for more information on Proxy setup. Enter 6 at the Firewall Menu. The Static WAN Address Menu appears. This menu allows you to add, list or delete static WAN addresses. Add. Enter 1 at the Static WAN Address Menu. The Add Static WAN Address Menu appears. This menu allows you to use a static WAN IP address. Enter the IP address of the WAN. List. Enter 2 at the Static WAN Address Menu. The List Static WAN Address Menu appears. This menu displays applied static WAN IP address. Delete. Enter 3 at the Static WAN Address Menu. The Delete Static WAN Address Menu appears. This menu allows you to delete static WAN IP addresses. List Interfaces. Enter 1 at the Interfaces Menu. The List Interfaces Menu appears. This menu displays defined interfaces. Press <ENTER> to view the next page of the list. • Configure MAC, Speed & Type. 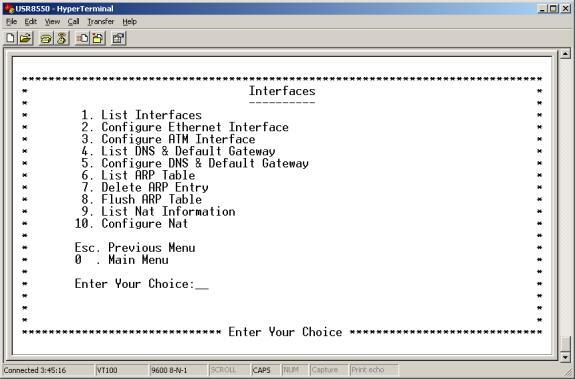 Enter 2 at the Configure Ethernet Interface Menu. The Configure Mac Speed & Type Menu appears. This menu allows you to assign MAC address variables to either Ethernet interface. • List DNS & Default Gateway. Enter 4 at the Interfaces Menu. The List DNS & Default Gateway Menu appears. This menu displays currently configured DNS and default gateway server information. • Configure DNS & Default Gateway. Enter 5 at the Interfaces Menu. The Configure DNA & Default Gateway Menu appears. This menu allows you to set DNS and default gateway variables. When the router functions as a Network Address Port Translation (NAPT) device, the router uses DNS relay settings. With these settings, the router forwards DNS requests from a LAN node to a known DNS server. Normally, the requests arrive at a DNS server over the WAN link. See DNS variables below. Internet site address that the router is a group of (i.e. usr.com). IP address of the Primary DNS that the router will use. Domain Name Server (DNS) is a server with a database. This server translates a domain name into the corresponding IP address. For example, USR.com resolves into IP address 231.222.320.04. Use this address to communicate over the LAN between the node and web site USR.com. IP address of the Secondary DNS that the router will use. IP address of the Default Gateway the Router is to use. Enabling or Disabling router ability to convey a DNS request from a LAN node. In this case, the node is on a DNS server at the WAN link. List ARP Table. Enter 6 at the Interfaces Menu. The List ARP Table Menu appears. This menu displays ARP table values. Delete ARP Entry. Enter 7 at the Interfaces Menu. The Delete ARP Entry Menu appears. This menu allows you to delete ARP table values. Enter the IP address of the ARP table value that you desire to delete. Flush ARP Table. Enter 8 at the Interfaces Menu. The Configure DNA & Default Gateway Menu appears. This menu allows you to flush ARP table values. List Nat Information. Enter 9 at the Interfaces Menu. The List NAT Information Menu appears. This menu displays currently configured NAT variables. If you see a ‘NAT Not Configured’ message, it means that you haven’t defined any variables. Enter 6 at the Advanced Menu. The VCC Menu appears. 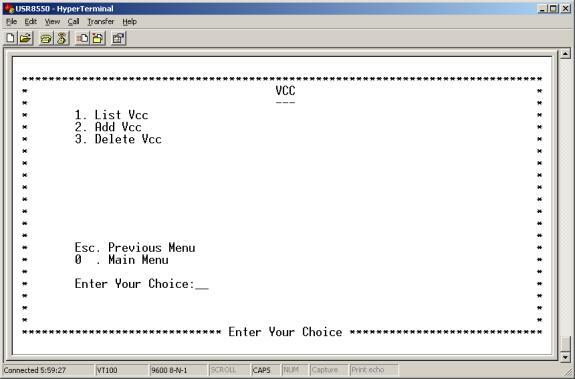 This menu allows you to list, add, list, or delete VCC. List VCC. Enter 1 at the VCC Menu. The List VCC Menu appears. This menu displays defined VCC variables. • Delete VCC. Enter 3 at the VCC Menu. The Delete VCC Menu appears. This menu Allows you to delete VCC variables. List PPPoA. Enter 1 at the PPPoA Menu. The List PPPoA Menu appears. This menu displays configured PPPoA variables. • Start PPPoA. Enter 3 at the PPPoA Menu. The Start PPPoA Menu appears. This menu allows you to start a PPPoA session by entering the session’s profile ID. • Stop PPPoA. Enter 4 at the PPPoA Menu. The Stop PPPoA Menu appears. This menu allows you to stop a PPPoA session by providing the session’s profile ID. • Delete PPPoA. Enter 5 at the PPPoA Menu. The Delete PPPoA Menu appears. This menu allows you to delete a PPPoA session by entering the session’s profile ID. • Default PPPoA. Enter 6 at the PPPoA Menu. The Default PPPoA Menu appears. This menu allows you to make a PPPoA session the default session by providing the session’s profile ID. List PPPoE. Enter 1 at the PPPoE Menu. The List PPPoE Menu appears. This menu displays configured PPPoE variables. • Start PPPoE. Enter 3 at the PPPoE Menu. The Start PPPoE Menu appears. This menu allows you to start a PPPoE session by entering the session’s profile ID. • Stop PPPoE. Enter 4 at the PPPoE Menu. The Stop PPPoE Menu appears. This menu allows you to stop a PPPoE session by providing the session’s profile ID. • Delete PPPoE. Enter 5 at the PPPoE Menu. The Delete PPPoE Menu appears. This menu allows you to delete a PPPoE session by entering the session’s profile ID. • Default PPPoE. Enter 6 at the PPPoE Menu. The Default PPPoE Menu appears. This menu allows you to make a PPPoE session the default session by providing the session’s profile ID. List MER. Enter 1 at the MER Menu. The List MER Menu appears. This menu displays configured MER variables. • MER Status. Enter 3 at the MER Menu. The MER Status Menu appears. This menu allows you to change between enabled, disabled, or deleted status. Enter 6 at the SNDCAP Menu. The PPPoE Relay Menu appears. This menu allows you to list, configure, or delete PPPoE relays. From this menu, you can also check the status of a PPPoE relay. List PPPoE Relay. Enter 1 at the PPPoE Relay Menu. The List PPPoE Relay Menu appears. This menu displays variables for configured PPPoE relays. • Delete PPPoE Relay Interface. Enter 3 at the PPPoE Relay Menu. The Delete PPPoE Relay Menu appears. This menu allows you to delete PPPoE Relay interfaces by providing an interface name. Enter 4 at the PPPoE Relay Menu. The PPPoE Relay Status Menu appears. This menu allows you to change PPPoE Relay Status between enabled and disabled. Enter 8 at the Advanced Menu. The IGMP Proxy Menu appears. This menu allows you to list, configure, or delete proxy interfaces. List Proxy Interfaces. Enter 1 at the IGMP Proxy Menu. The List Proxy Interfaces Menu appears. This menu displays configured proxy interface variables. Delete Proxy Interfaces. Enter 3 at the IGMP Proxy Menu. The Delete Proxy Interfaces Menu appears. This menu allows you to delete proxy interfaces by providing a specific interface name. Add PVC. Enter 2 at the Bridge Menu. The Add PVC Menu appears. This menu allows you to add a PVC by entering interface name, VCC, and encapsulation type variables. Bridge Status. Enter 3 at the Bridge Menu. The Bridge Status Menu appears. This menu allows you to change bridge status between enabled, disabled, and deleted. List Bridge Information. Enter 4 at the Bridge Menu. The List Bridge Information Menu appears. This menu displays configured bridge information. Press <ENTER> to view the next list page. Set Cache Timer. Enter 5 at the Bridge Menu. The Set Cache Timer Menu appears. This menu allows you to configure cache timer variables. Spanning Tree. Enter 2 at the Bridging Menu. The Spanning Tree Menu appears. This menu allows you to Provides the following options. Transparent bridges use the spanning tree algorithm to dynamically determine the best source-to-destination path. This algorithm avoids bridge loops (multiple paths linking one segment to another) within a network. The algorithm determines all redundant paths and makes only one of them active. The spanning tree protocol (STP) is part of the IEEE 802.1 standard. Router interface to be configured for spanning tree. Cost associated with that interface. Based on this cost, the bridge decides which link to forward data over. The options range from 0 to 65,535. Determines which port becomes the root port. Options range from 0 to 255. Determines which bridge becomes the root bridge. Options range from 0 to 65,000. All bridges in the bridged LAN use this timeout value. The root sets Max Age value. Options range from 1 to 60 seconds. Time interval between generations of configuration BPDUs. The root generates configuration BPDUs. Options range from 1 to 10 seconds. All bridges in the bridged LAN use this timeout value. The root sets the forward delay value. Options range from 1 to 200 seconds. Spanning Tree Status. Enter 3 at the Spanning Tree Menu. The Spanning Tree Status Menu appears. This menu allows you to enable or disable Spanning Tree status. List Spanning Tree Info. Enter 4 at the Spanning Tree Menu. The List Spanning Tree Info Menu appears. This menu displays configured Spanning Tree variables. Enter 3 at the Bridging Menu. The Filter Menu appears. This menu allows you to list, configure, delete, or flush filters. List Filters. Enter 1 at the Filter Menu. The List Filters Menu appears. This menu displays defined filter variables. Static MAC address to add to the table. What the router should do with a data frame from this MAC address. The options are Forward or Drop. Delete Filter. Enter 3 at the Filter Menu. The Delete Filter Menu appears. This menu allows you to delete filters by entering their MAC addresses. Flush Filter. Enter 4 at the Filter Menu. The Flush Filter Menu appears. This menu allows you to flush currently configured filters. Interface. Enter 1 at the Statistics Menu. The Interface Menu appears. This menu displays interface statistics. The table below defines interface parameters. TCP-IP. Enter 2 at the Statistics Menu. The Interface Menu appears. This menu displays TCP/IP statistics. DHCP-Lease. Enter 3 at the Statistics Menu. The DHCP Lease Menu appears. This menu displays DHCP statistics. With no active DHCP leases, the list is empty. AAL5. Enter 4 at the Statistics Menu. The AAL5 Menu appears. This menu displays ATM AAL5 statistics. SNDCP. Enter 5 at the Statistics Menu. The SNDCP Menu appears. This menu displays packet information for the permanent virtual circuit (PVC). The system organizes the list by encapsulation method. Bridge. Enter 6 at the Statistics Menu. The Bridge Menu appears. This menu displays bridge statistics. Enter 1 at the Statistics Menu. The Firewall Statistics Menu appears. This menu displays firewall flow statistics. Enter 2 at the Statistics Menu. The Firewall Statistics Menu appears. This menu displays FTP Proxy statistics. Enter 3 at the Statistics Menu. The Firewall Statistics Menu appears. This menu displays HTTP Proxy statistics. Enter 11 at the Advanced Menu. The Diagnostic Menu appears. 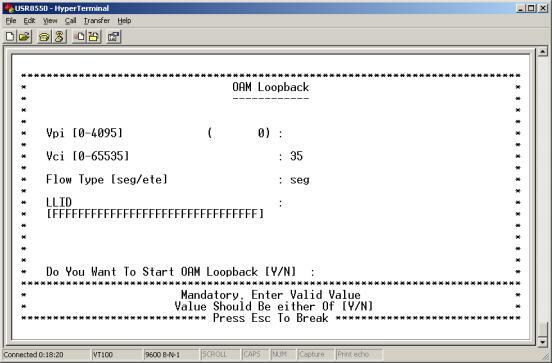 To perform an OAM loopback test on a VCC, enter 1. To perform a ping test, enter 2. Enter 12 at the Advanced Menu. The Version Menu appears. This menu provides software version information for your router.